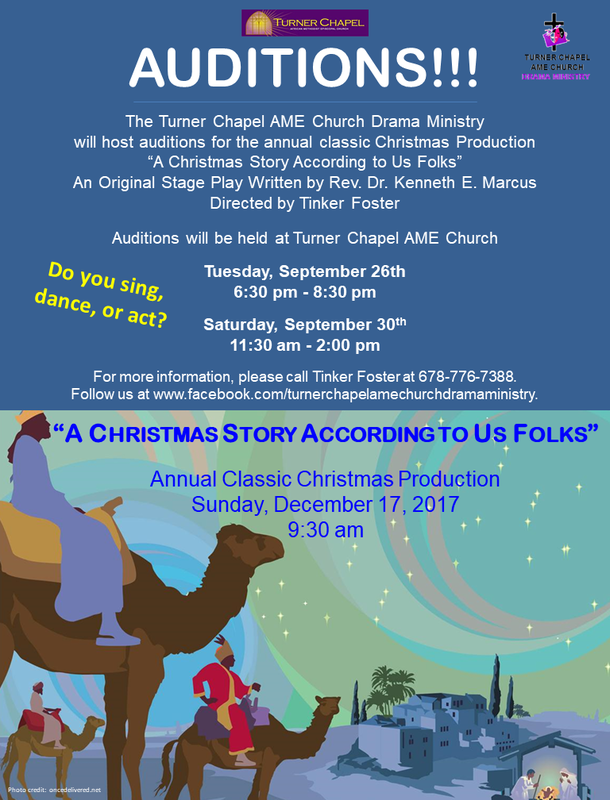 The Turner Chapel AME Church Drama Ministry will be casting for ALL ROLES for the annual classic Christmas Production “A Christmas Story According to Us Folks.” This is an original stage play written by Rev. Dr. Kenneth E. Marcus & directed by Tinker Foster. It tells the story of the birth of Jesus from the perspective of the African Methodist Episcopal Church. Auditions will be held at Turner Chapel AME Church – 492 N Marietta Parkway, Marietta, GA 30060. For more information, please call Tinker Foster at 678-776-7388.